An aquamarine and diamond tiara once owned by Princess Alexandra of Hanover and Cumberland is set to be auctioned at Christie’s Magnificent Jewels sale in Geneva. Christie’s upcoming Magnificent Jewels sale in Geneva will present a never-before-auctioned aquamarine and diamond tiara once owned by Princess Alexandra of Hanover and Cumberland. Crafted by Fabergé in 1904, the piece was commissioned by Frederick Francis IV, Grand Duke of Mecklenburg-Schwerin, as a wedding gift for his bride. The tiara, which has a pre-sale estimate of CHF 230,000 to 340,000 (CAD$309,412 to $457,392), features nine graduated, pear-shaped aquamarines and old-, cushion-, and rose-cut diamonds. 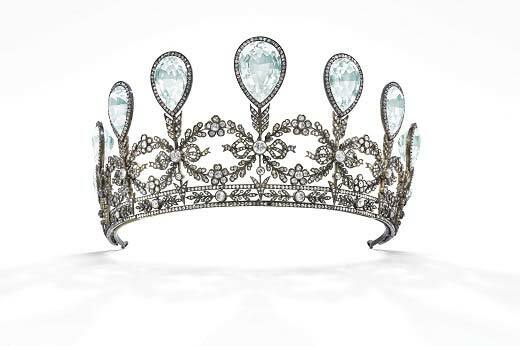 “This Fabergé tiara is of symbolic design with forget-me-not flowers tied with ribbon bows, signifying true and eternal love, pierced by arrows representing Cupid, a token of endearment, attraction, and affection,” Christie’s stated. The piece can be viewed in London from April 9 to 11, and again in Geneva from May 10 until it is auctioned on May 15.